Of course, there are no rules when it comes to makeup and what colours you decide to wear. However, there are a few tips and tricks you can choose to use if you are looking to enhance the natural colour of your eyes. If you are an avid makeup lover, chances are you will already know all about basic colour theory. But it's probably one of the most important things anybody just starting out could possibly learn, hence the reasoning for this post. Colour theory works for just about anything in life, and is not necessarily a tool solely for makeup artistry - but by using something called the Colour Wheel, you can easily differentiate which colours will naturally make your eye colour 'pop' and appear more vibrant. Colour Theory is also important in other areas of makeup artistry, including foundations, concealers, etc. but here I will be focusing more on the eyes. It may look scary and confusing at first, but by knowing how the colour wheel works, you will easily be able to see what colours are best suited to your very own eye colour. I threw this colour wheel together myself to avoid any copyright issues, so please excuse it's scruffiness. 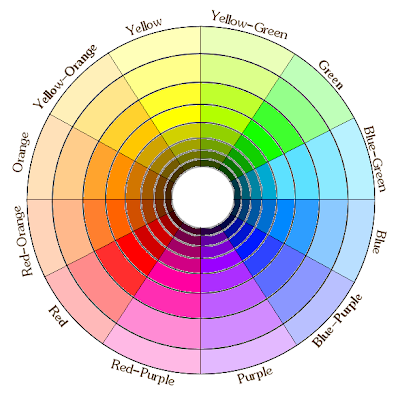 First, I will explain what the colour wheel actually is. Each colour wheel you will come across is made up of three diffrenet catorgories, including Primary Colours, Secondary Colours, and Tertiary Colours. The Primary Colours are: Red, Yellow and Blue. These colours are the three pigment colours that can't be formed by a combination of any other colours. Every other colour or shade is derived from these three hues alone. The Secondary Colours are: Green, Orange and Purple. These are colours that are formed by combining any of the colours. These are the colours that are formed by mixing a primary and a secondary colour. These are probably best described as 'sub' shades and the mixing of a both a primary colour and secondary colour are what give a tertiary colour it's undertone. Now, I hope that makes sense. It's always useful to know about primary, secondary and tertiary colours as - like I said earlier - this theory covers a much more broader spectrum than just the eyes when it comes to makeup. So, on to the tips! First, refer to the chart and find the shade that is closest to your own eye colour. Then, look at the colour that are directly opposite that colour. This is the colour that is best suited to your eye own colour. If the colour is too bright or outlandish for your liking, look at the surrounding, more subtle colours instead. Applying these shades instead will work in the same way, but the results will be minimized. For instance, my eye colours falls mid-way into the 'Blue' category, therefore, the shade that is most likely to bring out the colour of my eyes is the colour that falls midway into the 'Orange' category. Bright colours aren't always that wearable though, so - in my case - I would be more likely to opt for an orange based shade, such as a coppery eyeshadow. Basically, the more contrasting the colour is to your own eye colour, the more this will 'clash' and result in a brighter, more vivid eye. This is the same method that is also used when applying colour correction concealers. For instance, if there is a lot of redness to the skin, a green-based concealer would be applied to the area to cancel out and neutralise that redness. Have you ever come across any anti-redness creams and wondered why they are usually green? This is why! The same technique would be applied when applying foundations - a person with cool/blue undertones to their skin would more likely be better off using an orange-yellow based foundation. For example, this is why MAC NC (Neutral Cool) shades are yellow based. However, as this is just a guide I would always recommend to consulting the brands representative before choosing your foundation. I hope all of that made sense and will help you find your when it comes to colour theory. Thanks for reading! Thank you so much, it was veeeery usefull ;) And your make up is always beautiful, you are very talented!! You're so welcome! I hope it helped - thank you very much! Thanks for sharng this makeup theory with us. it is very useful. I always like your makeup . Thanks again. You're welcome! Thanks very much, Junaid! This is so informative and helpful for the women's who do make occasionally like me and don't have that much knowledge about makeup. Thanks for sharing this basic makeup tips.